Members of the Peewee BB Crunch with their bronze medals following an overtime win. Submitted photo. 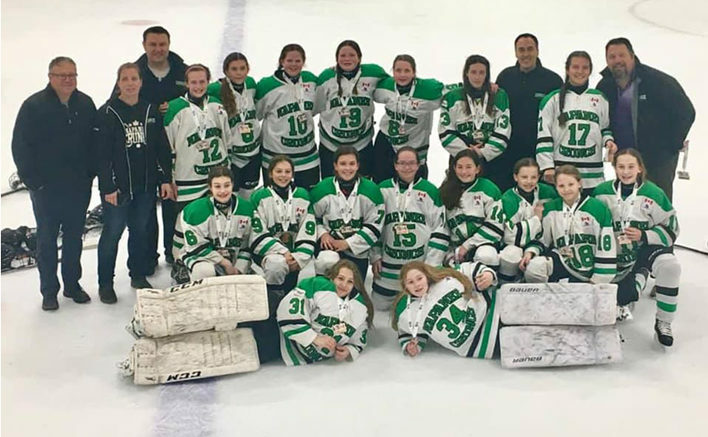 The Napanee Peewee BB Crunch squared off with the top teams in their 38 team league this weekend, capturing the bronze medal at the Lower Lakes Female Hockey League Best of the Best tournament. With bronze on the line, the Crunch were pitted against the Markham-Stouffeville Stars, who they had topped 1-0 earlier in the tournament. The bronze medal game was another tight affair, with neither side finding the back of the net through regulation time, resulting in a 4-on-4 overtime. Both sides traded scoring chances at opposite ends of the ice before Napanee’s Claire McConnell chipped a puck past the defense and went in on a partial 2-on-0. She took a hard wrist shot that the goalie stopped, but left the rebound there for Kristen Sutton, and she didn’t waste any time burying it into the back of the net to seal the win and clinch bronze. In order to qualify for the Best of the Best tournament, the Crunch had to defeat Whitby, winning in two games, and Peterborough, not giving up a goal in three games, to get to the year end tournament. They were then matched up against the four other best teams from the 38 team league. Game 1 for the Crunch was a tough 2-1 loss to the Hamburg Hawks. Brooklyn Alaver had the lone goal. The next match was against the second ranked team in the entire province, the Kitchener Lady Rangers. The Rangers jumped out to an early 1-0 lead but that was all the scoring the Crunch would allow winning, 2-1. Keyra Herrington played very well for the win and the Crunch got a goal from McConnell assisted by Charlie Weir who just came back that day from a broken leg suffered in January. Sutton scored the other. Game 3 was against the same feisty Markham-Stouffeville Stars team they’d meet in the bronze medal game. The Crunch attack was relentless, holding the Stars to very few shots, winning 1-0. Diana Wharton was solid in net when she needed to be and McConnell scored on a great shot from the slot. Game 4 was a tough 4-0 loss against the Chatham Outlaws, which pushed the Crunch to the bronze medal game on Sunday morning. The Best of the Best tournament now wrapped up, the Crunch will be playing this coming weekend, in the Provincial Championships in Etobicoke.